Resolution 1: Honoring Mike Masaru Masaoka for his leadership and service to the welfare of the Japanese American community. Resolution 3: Recognizing and preserving Japanese American Art by incarcerated Japanese Americans during World War II. Resolution 4: Supporting House Representation 40, establishing a commission to study the institution of slavery in the United States. Emergency Resolution 2: Calling upon the JACL to be an ally to the transgender community. In its weeklong session, the National Council’s agenda included an AARP Workshop by Jennifer Wallace-Brodeur; a Civic Engagement Presentation on voter registration programs, campaign development and voter mobilization by Rebecca Apostol; an in-depth report from the National Council of Asian Pacific Americans by Kelly Honda; a special report on the 2017 Smithsonian Exhibit by Noriko Sanefuji; and a presentation by the Social Security Administration by Marianne Brackney. National Council members also listened in on a LGBTQ Plenary with Hyacinth Alvaran, Mia Yamamoto and Bryan Chan, who discussed what it means to be Asian American LGBTQs and educated members on understanding current issues. Minister Tamaki Tsukada of the Embassy of Japan was joined by Consul General Jun Yamada after announcing this year’s Kakehashi Project would make the program a permanent annual commitment and would double the number of partipants to over 180 individuals. Reports from across the organization included the Program for Action, and the Nomination’s Comittee presented its future initatives and provided in-depth summaries to its past achievements. 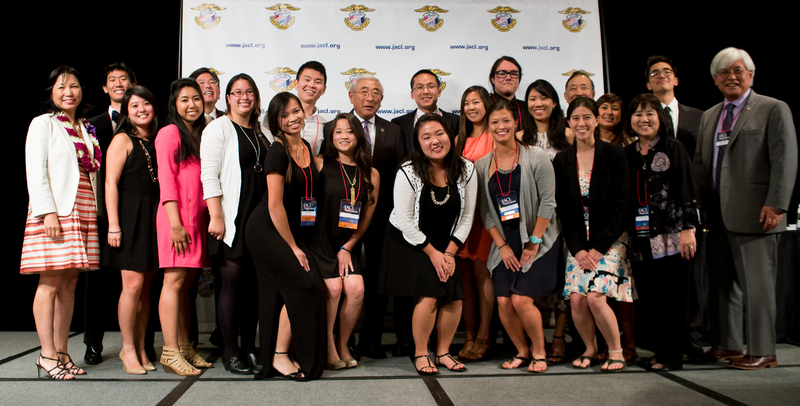 In concluding the convention, the Sayonara Banquet honored and recognized Mike M. Masaoka for his effort, dedication and service to the Japanese American community during redress and post-war activism. Grant Ujifusa and former Cabinet Sec. Norman Y. Mineta gave special reflections on Masaoka, remembering his powerful legacy and work. JACL President’s Awards were given to Betsy Young and Jane Kurahara for their work on preserving the Honouliuli incarceration campaign in Hawaii. J. D. Hokoyama was also honored for his leadership and service as president and CEO for Leadership Education for Asian Pacifics. A special honor was given to Gene Honda, stadium announcer for the Chicago White Sox and the Chicago Blackhawks. Master of ceremonies David Ono hosted the evening. Ono is an anchor at ABC7 and Emmy Award-winning producer of the “Legacy of Heart Mountain” documentary. 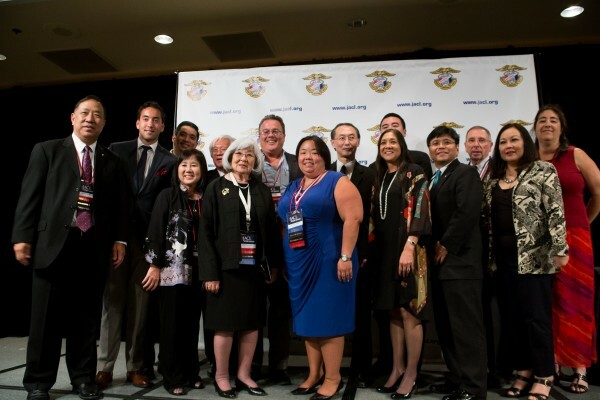 JACL Executive Director Priscilla Ouchida and National President David Lin have confirmed that the 2016 National Convention will return to Las Vegas, but future plans for 2017 may return to Washington, D.C.